Check it out, like it, subscribe if you want! 🙂 Thanks for your support! Yoga teacher training isn’t just an opportunity to learn to teach yoga, it’s where you refine all levels of your yoga practice. The yoga teacher trainings I have participated in always felt like stepping into a cocoon to emerge at the end with glistening wings of knowledge and love. Yoga changes your life, yoga teacher training is the acceleration of your evolution into the best version of yourself. We will meet for 9 modules either the 2nd or 3rd weekend per month. This program begins April 13, apply and reserve your spot at IBW. I decided to go vegan this past May after a lot of internal struggle about letting go of my attachments to dairy and eggs. In the end, I don’t feel okay with animals existing in subpar conditions just because I want to feed my tastebuds. But also, dairy and eggs aren’t the best for our gut bacteria and therefor our overall health, not to mention the health of the planet. (It’s all connected). I had already been a gluten free vegetarian for 7 years. With thanksgiving rolling around the corner, I sought a pumpkin pie recipe that had no eggs, wheat flour, or condensed milk. The recipe was as close as the book shelf in my home studio space, adjacent to my kitchen. A student gave me Cafe Gratitude ‘a recipe book called I Am Grateful. I highly recommend the book!!!! We might not be able to make huge improvements for world everyday, but we can at least do a little improvement each day. Collectively the little acts of service add up. After a year of meeting once a week for yoga practice, the Eco Yoga Community has prevented 20 metric tonnes of CO2 from being released into the atmosphere by preventing deforestation! Will you help us double that number for the second year of Eco Yoga? This class is offered each Sunday at 10AM – 11:15 at the Pink House Studio on the intersection of Booth and Wright in Riverwest, Milwaukee, beginning April 30! $14 per drop-in, or $100 for a 10-pack. 20% is donated to save the rainforests, save the critters, save the humans! Humans are conditioned to suffer; suffering seems normal and we just accept it as part of life. We continue destructive behaviors even after we’ve been shown the harm we are inflicting on ourselves and others. Once we see the harm we cause, we feel guilty and the cycle is complete, we’re suffering again. There are three ingredients in the recipe for success for relieving suffering, according to Sri Prem Baba: svadhyaya, or self-study and the study of sacred texts, humility, and sadhana, or spiritual practice. Svadhyaya allows us to discover ourselves – what is ego, or the false self, and what is our True Self? Notice your thoughts, daily patterns and choices this is your starting point. Sacred texts are helpful in describing the true self. Sat chit ananda, your true self is eternal, unchanging, blissful. My suggestions for useful texts: Light on Life by BKS Iyengar, Sri Swami Satchidanda’s commentary on the Yoga Sutras of Patanjali, and Swami Vivekenanda’s Jnana Yoga. As you read these helpful texts, now observe yourself in light of the texts- what would Iyengar, Vivekenanda, or Satchidananda say? Humility attracts wisdom, and pride or arrogance chases wisdom and divinity away. Humility also keeps us on our toes. When we’ve think we’ve gotten control of our senses and emotions, they can more easily sneak up on us. Pride also makes us feel like we know, so in a way it makes our cup full; humility is like an empty cup in which lessons from the divine can flow in and further fill us up. Sadhana keeps stripping away the false self and brings us back to the present moment to check in with ourselves. Sadhana is like an internal cleanse, all day long we are collecting impressions, like a house gathering dust. Sadhana is our way of directing the impressions for a set amount of time in order to keep a cleaner house. 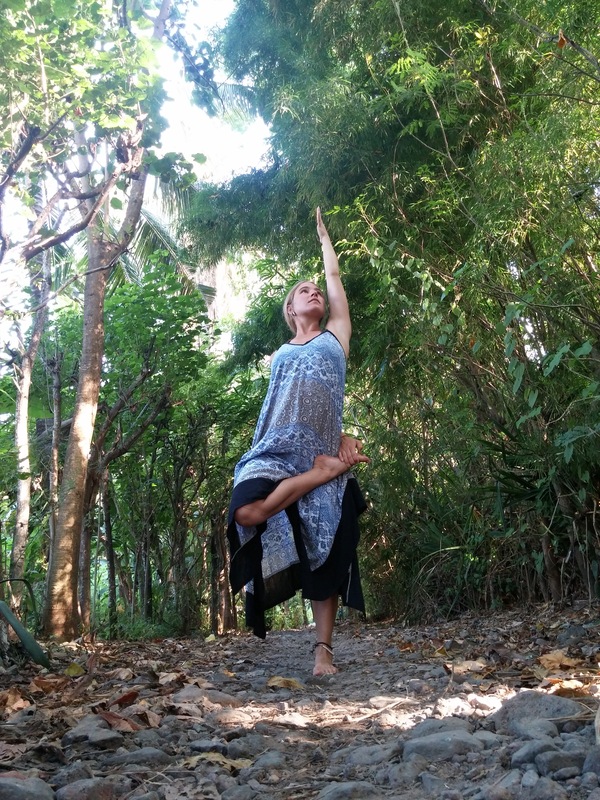 Sadhana is making a conscious choice about what we’re doing and what we’re focusing on. If you feel like you’re being used, it’s because you are. If you feel like you’re being used, it’s because you are. You are an instrument of the divine. Your voice, your actions, your deeds are all in service of the highest. What the highest is, or what is divine, that is up to your beliefs, only you know for yourself. All I can say is that you are powerful, especially if you recognize yourself as a channel or pathway of divinity. In our time of feeling politically disenfranchised, in our time of feeling so small as individuals in face of climate disaster, in our time when we feel pitted against one another, as a yogi, as an instrument of divinity myself, as a teacher, a friend, a lover of you, I must say that you have the power of the universe, of nature, of God, of the divine on your side. We all do, it’s just that many forget. Even I can forget as I wallow in self pity over conflict. What does the divine want? How can you serve this higher purpose? Well, you are divine. So what do you want? What are your goals? And then, what is your starting point? How can you connect where you are in this moment with where you want to be? What’s your first step? And then the second? Don’t worry about filling them all in, one step at a time. Empower yourself and others by believing and seeing the highest in yourself and in them too. Finally, let yourself be used. It’s a lesson in humility for sure, so the ego will want to fight it. This is ishvara pranidhana, the last and most difficult of niyamas, or observances in our foundational yoga practices. Ishvara pranidhana is the surrendering of our small self to our highest Self, the Self that is in all other beings. I write as a concerned yogi that shares the planet with you. It is up to us, you and me, and our friends, to choose environmentally sound modes of transportation and fuel. We can reduce the miles driven in fossil-fueled cars in order to ensure that all of the organisms that we share Earth with can thrive in the coming decades and centuries. We are at a tipping point that doesn’t require terribly in depth research to understand the consequences of for yourself and all living creatures. At the tipping point, every decision is crucial. Empower yourself with tools of activity that slow down climate chaos! One solution out of many? Ride a bike or walk instead of sitting in the car. Not only does your fuel switch from petroleum to your yummy breakfasts, lunches, and dinners, but you are also pumping your heart, moving your body in an era of sedentary lifestyles, thereby preventing chronic mental, physical and emotional illnesses! Let’s bike our way into the futures of sloths, tigers, and toucans and humanity! 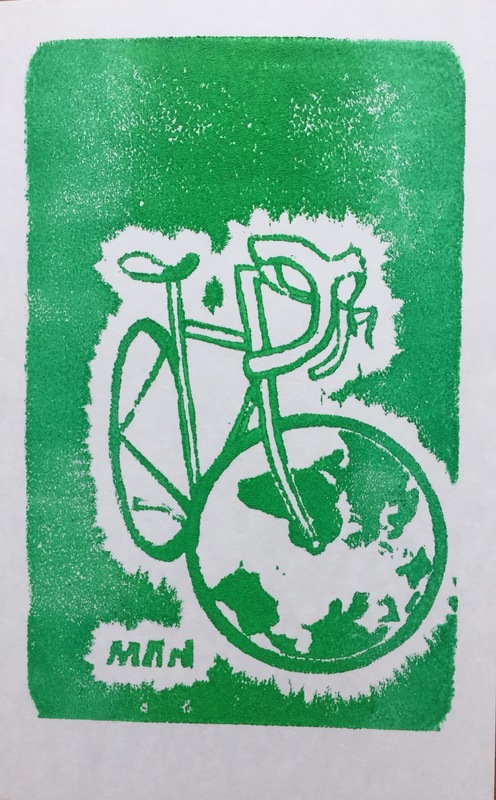 This relief print is made from recycled styrofoam used for food packaging and printed with acrylic inks that were taken out of the trash pile left by art students moving out of their apartment! It is 5 by 8 inches and only $10 (plus shipping). Email morganherum@gmail.com if you’d like to order one!